In this letter, written from Burlingame, Kansas Territory, James R. Mead informs his father that he had come back to eastern Kansas to work for Mr. Titus, presumably pro-slavery Colonel Titus. Mead still maintains a ranch and trading post on the Saline River near Ft. Riley. 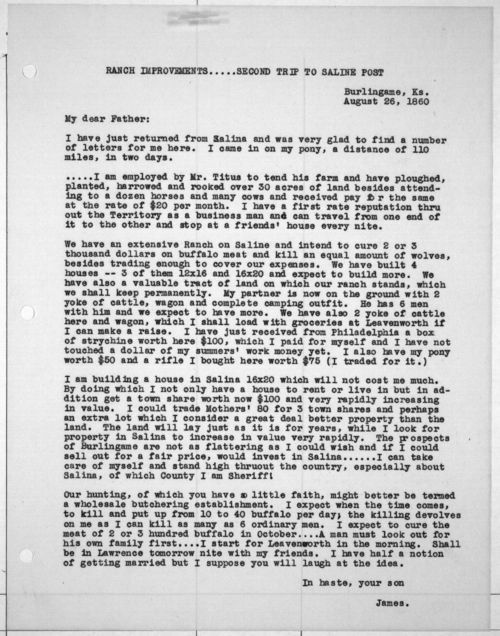 Mead also writes to his father about a home that he was building in Salina. He callshis buffalo hunting "a wholesale butchering establishment," and writes he was going to cure the meat. Apparently he has developed quite a reputation in the area, and he had been made sheriff of Saline County. These typed copies of the James R. Mead's letters were donated to the Kansas State Historical Society by Mr. Mead's family in 1940 when the originals were still owned by the family. The originals are now held by Wichita State University. This source demonstrates the commercialization of hunting and works in tandem with Mead's other letter selected for this standard (dated November 7, 1859) and with images of buffalo and buffalo hunting. Collections - Manuscript - Mead, James R.